Come have a nice time painting your best pet with me. I draw your pet onto a 12″ x 16″ stretched artist canvas before class. This way when you come to class, you get to do the fun part, the painting! No worrying about having to draw! No experience or prior art classes required. All supplies are provided. My classes have nice casual atmosphere where we paint and talk about our pets. 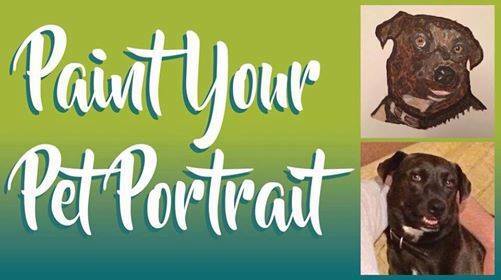 You will be going home with a portrait of your pet painted by you! Usually a good photo of your pet’s head and shoulders works best. I would like to suggest that you paint only one pet per canvas, please. This class is scheduled for Friday, April 5th from 5:30pm til 8:00pm. Registration ends Wednesday, April 2nd. Each ticket is $40 per person. All sales are final. No refunds are given unless the class is cancelled. Please EMAIL A PHOTO of your pet to Sherry at airofwhimsy@gmail.com by Tuesday, April 2nd at the latest (prior to the class). This way I will have time to draw your pet on the canvas and have ready to paint before class. Look forward to having you in class! Class minimum is 5, maximum is 10.